Winter is not over yet and we still have plenty of opportunities for more snow. However, even if it is heating up where you live, it might be a great time to jump on some of these products since prices will sink during the warmer months. Here is a list of some of the absolute best SnowEx spreaders that will make your life so much easier next time it snows. These products are spreaders that distribute rock salt on ice to help us not to slip. Next time you fall on an ice patch you’ll rethink not owning one of these. The following is a list of the top 5 SnowEx spreader products from each primary category of salt spreaders: truck bed spreaders, tailgate spreaders, tow-behind spreaders, walk-behind spreaders, and dump box spreaders. This SnowEx truck bed spreader has up to 6 cubic yards of capacity. That means that it can go for a long time and give a longer application. It is excellent for big jobs like parking lots or streets. One of the fantastic things about this machine is the way the weight is distributed. The unique hopper and auger design of this SnowEx spreader distributes the weight evenly instead of it all sitting in the back like traditional spreaders. On top of that it’s got a patented multi-angle design on the hopper which creates a smooth and reliable flow that can’t be matched. 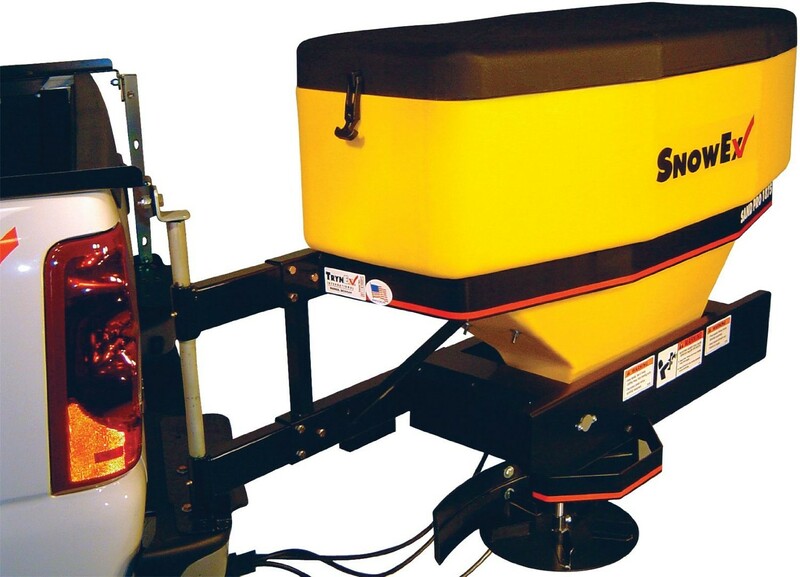 The structural composition of the SnowEx spreader is solid steel with poly hoppers to stand the weather. This SnowEx spreader has a high flow auger that is excellent at spreading the rock salt. This also has a patented spinner motor that gives an outstanding performance every time. The wireless control is why this machine was put on the list; it makes the machine so easy to use. Rock salt is a tricky thing to work with and require very special feeding systems, but this machine handles it perfectly. Because it's a more digital-based SnowEx spreader compared to the other options, it can be a bit more difficult to fix when repairs are needed. Finding SnowEx spreader parts for the wireless model are little bit harder to come by. The TowPro SnowEx spreader has a rather large capacity of 1.4 cubic yards which means that it can take on big jobs. Garages or parking lots don’t stand a chance against this machine. It has an electric shutoff that controls the throat of the spreader so that spillage is reduced to a minimum. It is weather resistant SnowEx spreader and structurally sound overall. 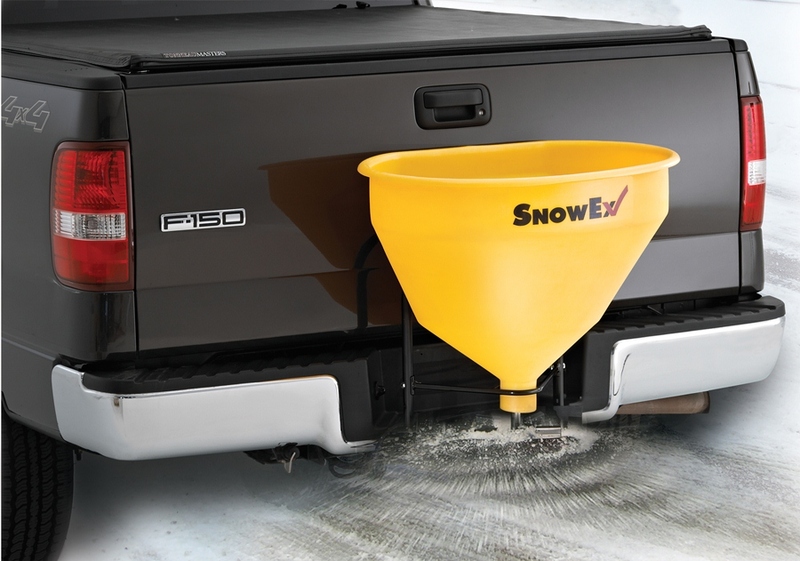 This SnowEx spreader is perfect for tight spaces like sidewalks. The capacity ranges from 100 to 160 pounds which is more than enough to clear the walk way up to your house. The extra wide throat maintains perfectly smooth flow, and a deflector skirt controls spillage. This is an excellent product. This is a must have product for anyone with a dump truck. The V-Maxx mounts right on the back without any annoying or frustrating assembly. No hydraulics or hoses are required, just mount it on the back of the dump truck and it’s good to go. Like the other SnowEx spreaders, this one also has an excellent flow mechanism and it's pretty easy to repair as you can find many sources of SnowEx parts that support these models. The structure is solid and weather resistant. Again, this is such an easy product to use which makes it a must have for any dump truck users out there.